An increasing number of child welfare agencies are considering using predictive analytics in their work. Typically they do so by contracting with a vendor to develop and maintain a predictive analytics model that is used by the agency to predict risk of a specified outcome. There are significant differences between contracts for these services and other types of contracts child welfare agencies enter into. This document identifies some of those differences and outlines sections for a request for proposals (RFP) suited to procuring predictive analytic capability. It provides guiding principles and ideas that should be considered during the contract development process, and walks through examples specific to the context of child welfare. Every agency’s priorities and stakeholders are different, and no set of suggestions will be relevant for every RFP. 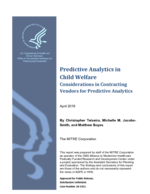 Therefore, this document constitutes a set of guiding principles intended to help inform agency staff considering contracting for the development and/or implementation of a predictive analytics model applicable to child welfare services. Suggestions focus on three sections of the acquisition package that most need information specific to predictive analytics: the Requirements Documentation, Special Contract Requirements, and Evaluation Factors for Award.